← New for Halloween 2016: M&M’s Walgreens Exclusive Glow-in-the-Dark Fun Size Packs! 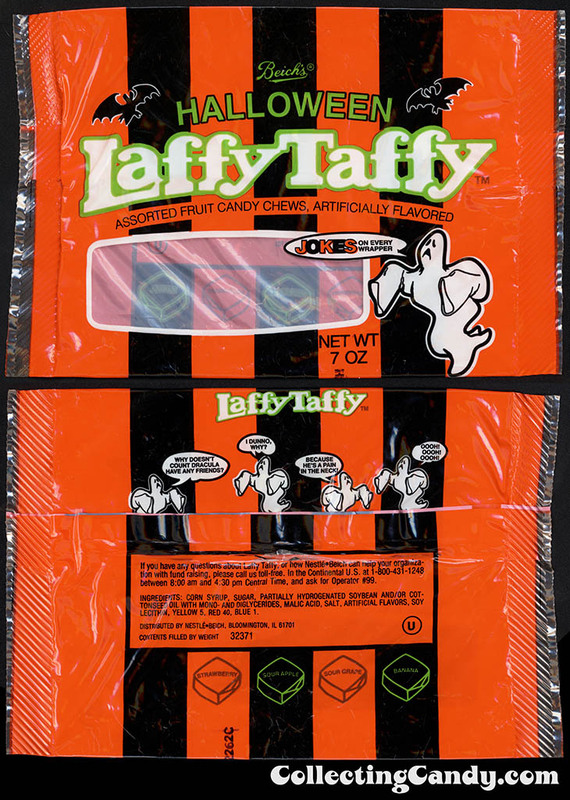 Back during the late 1980’s and early 1990’s, the Beich’s candy company was going through some rapid corporate transformations, but along the way they played around with Halloween seasonal releases of their most enduring product; Laffy Taffy. Make the jump to check it out! Right around 1990, the Beich’s candy company would be acquired by Sunmark/Concorde Brands, which was also becoming a part of Nestle at the time. 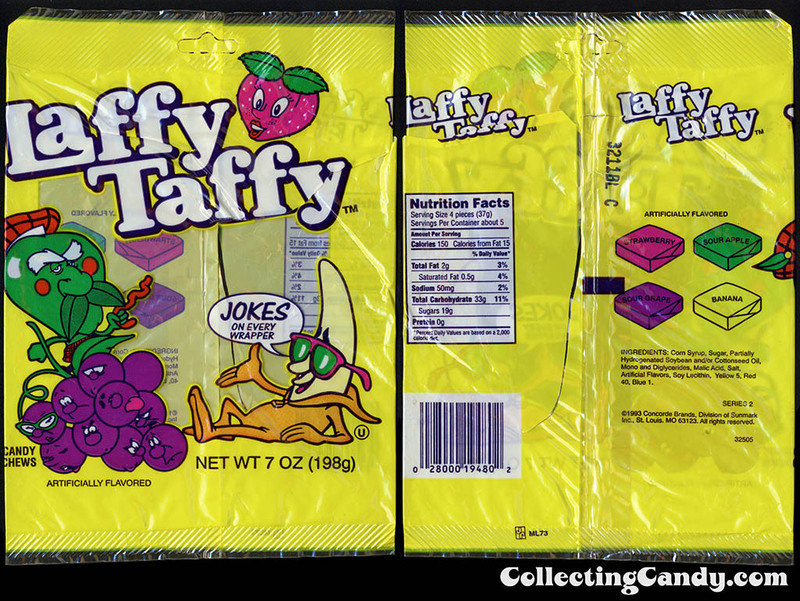 This would eventually lead to things like Beich’s Laffy Taffy enveloping Sunmark’s Tangy Taffy – with Tangy Taffy surviving but taking on the Laffy Taffy brand name, among other things. It’s a more complicated bit of confectionery history than I want to get into today, but needless to say, the folks at Beich’s continued to work on creating fun seasonal variations of their products through those rapidly changing times. That is certainly true where their Halloween seasonal product was concerned. Several of the pieces I have to share today came to me by way of a design contractor who worked with Sunmark, and while they have the appearance of a final product, they might have actually been pre-release mockups of some sort. The only hint that some of these aren’t final production releases is that they lack UPC codes on the packs. I’m going with the assumption that these did eventually make it into retail circulation, but you never know, these might not have ever been distributed. All in all, today’s write-up doesn’t contain a lot of hard hitting confectionery history, but I’m hoping that it serves as an entertaining glimpse as well as a historical marker. 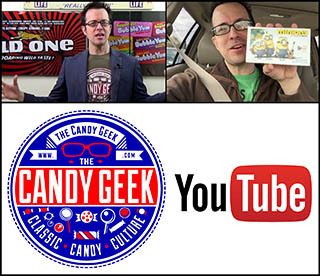 With more research and luck, I plan to eventually return to Laffy Taffy to assemble a clearer picture of this brand and its complete evolution. 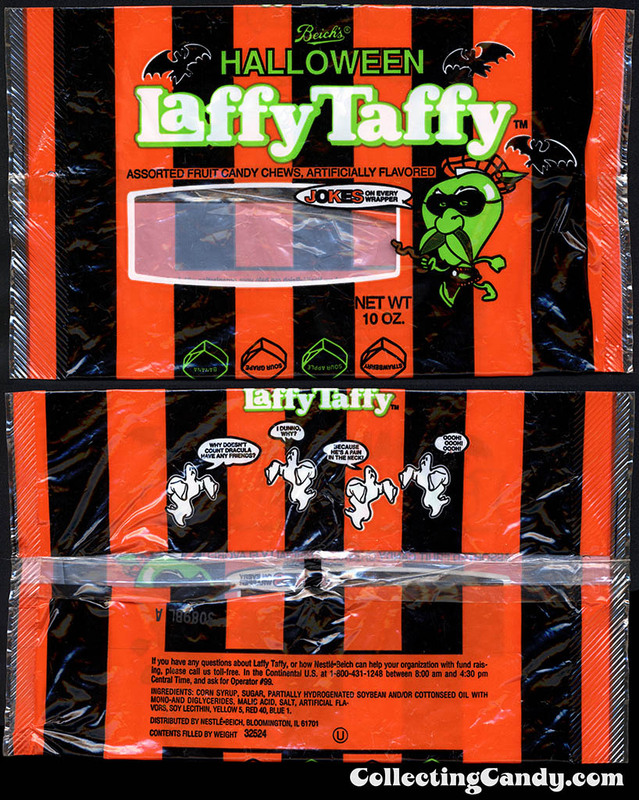 And that’s everything I’ve got for today’s post on Beich’s Halloween Laffy Taffy of the early 1990’s. See you next time! 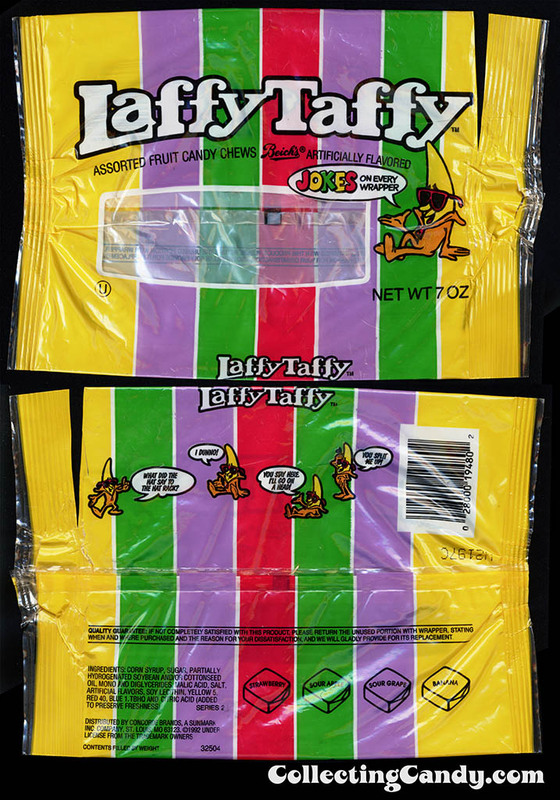 This entry was posted in 1990's, CountdownToHalloween, Halloween, Nestle, Wonka and tagged 1990's, 1990's candy, 90's, 90's candy, candy collecting, candy collection, candy collector, candy wrapper collection, candy wrapper collector, collectible, collecting candy, confectionery, confections, Halloween, Halloween candy, Laffy Taffy, packaging, packaging design, sweets, Tangy Taffy, vintage candy wrappers, vintage Halloween, wrapper. Bookmark the permalink.